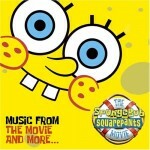 Andy Paley and Tom Kenny wrote “The Best Day Ever,” “Under My Rock,” and “Employee Of The Month,” all which appeared on the SpongeBob SquarePants Movie Soundtrack. Little Steven Van Zandt chose “Under My Rock” as his “best song of the month” on his Underground Garage show on Sirius XM upon its release, making it an official garage rock classic. It was played alongside The Seeds, The Knickerbockers, The Castaways and Richard and the Young Lions!